We help leading business entities, government agencies and startups create product and workplace solutions that provide verified levels of ergonomic performance. We have more than 40 years of experience in formal ergonomic research, product design evaluations, and workplace/workstation audits. We have conducted professional ergonomic audits for many leading corporations and government agencies in a wide range of industry sectors. These research programs have often assisted in the identification and resolution of critical ergonomic problems. We apply scientifically valid ergonomic theory and practice to the resolution of complex business and process design problems. Our studies produce focused, actionable findings on tactical and strategic levels. Clients tell us that we are especially adept at working with occupational safety and health groups, product development teams, market research executives and strategic planning groups. We are comfortable reporting to and working with all levels of corporate management. 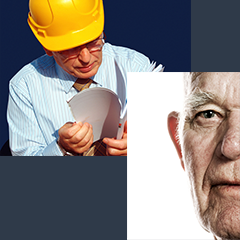 With over 40 years of experience in physical ergonomics, we have created solutions for a wide body of users ranging from represented workers to medical patients with advanced health conditions. Our experience with ergonomically complex products provides our firm with the expertise needed in order to design based on various demographics. Our expertise extends across many product categories and industry verticals covering product, workstation, and workplace ergonomic optimization programs. We offer specialized expertise in the combining of physical and cognitive ergonomics. 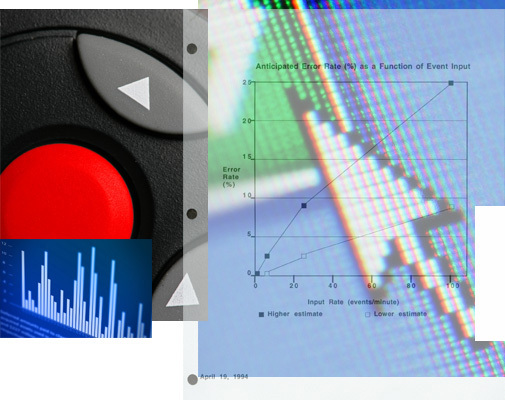 We have developed and employ advanced data acquisition methods and apply robust statistical methods to all data. We employ professional ergonomic field auditing and related data gathering methods and have extensive experience conducting complex ergonomic analysis in demanding environments ranging from high security military systems to complex process control applications. In all projects, MUS employs the latest data recording technology to produce reliable task documentation used in formal analysis and recommendations. We are uniquely qualified to provide formal professional ergonomics for a wide range of industry sectors and user profiles. 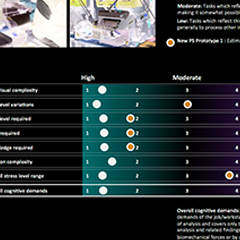 Our specialized testing systems include proprietary technology covering EMG, EEG, Newtonian force measurement, cognitive task analysis and formal job training design. Our expertise covers both physical and cognitive ergonomic disciplines. This provides you with highly focused and reliable data that addresses the specific problems at hand. We also have special expertise in skill acquisition theory and training systems development which allows us to parse ergonomic problems based on combinations of employee selection, training, workplace improvements, tool and fixture design and process optimization. Executed extensive complex ergonomic analysis of computer-based workstations for consumer and commercial applications. These programs included examination of physical ergonomic attributes of existing and prototype workstation configurations combined with screen-based content organization and optimization. We have extensive experience in many industry sectors and verticals. We have executed extensive ergonomic analysis and optimization programs in numerous industrial maintenance application areas. The focus of these studies and related optimization programs was the benchmarking and creation of updated, ergonomically robust and reliable maintenance procedures and related supporting hardware and software. We have extensive experience with represented workers in this category of ergonomic research.